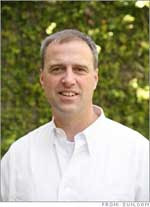 Dave Douglas is the VP of eco-responsibility at Sun Microsystems and was recently featured on CNN Money as well. Sun is one of those vendors that everyone has heard about but no one outside of IT really knows what they do; this is primarily because they have not catered to the consumer market (although they do have desktops for sale, some of them using the power of a night light). It's unfortunate because they have had a great green computing program for some time. Sun's position on green computing is well thought out and deep - read their sustainability paper to get a sense of their profound strategy. They invented novel items like the black box, a trailer full of servers that you can cart around and provide computing where you need it. Sun also bought a tape archiving company a few years ago, based on the (very practical) fact that tape is far more energy efficient than digital archiving. And 55 percent of their employees don't even have an office, which saved them 67.8 million in real estate costs in 2006. Add those items to the fact that Sun recycles 99.7 of all their returned product materials in California, and you might get the sense that they are really doing something new.